Now that you’ve seen my cover a couple of times, I thought you’d like to know why we chose this image. A well-crafted cover carries the mark of the publisher as well as the author. The illustration on the front clarifies the message or the subject matter. We considered many different photos such as an artist’s palette and brushes; a woman dancing in a field with arm extended, paintbrush in hand as though she were painting the sky; and just blotches of paint across the cover. But I feared most readers would look at the cover and think it was designed for visual artists only. 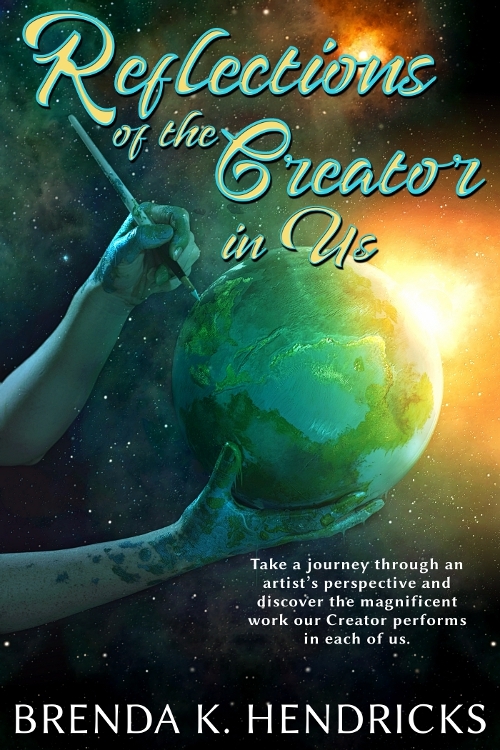 Reflections of the Creator in Us uses art procedures to convey God’s work in each of us. Therefore, it’s audience is much broader than just those who paint pictures. Besides, I use examples from the performing arts as well as those from the visual arts. I wanted something that reflected the deeper nature of the contents. When I found the illustration of the artist holding the world in one hand and paintbrush in the other, I knew I’d found what I’d been looking for. The designer at Lighthouse Publishing of the Carolinas agreed and did an excellent job of creating this beautiful cover. I think the image combined with the title piques the curiosity of my readers and invites them to pick it up and investigate the messages. What do you think?